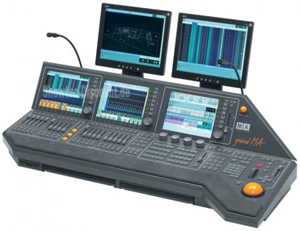 The High End Systems Hog 1000 console integrates unprecedented power and functionality in compact lighting controllers. The board has an intuitive programming interface and features many of the most powerful features of the classic Wholehog 2 operating system. Its features include: Editable personalities for all major fixture types, Familiar command line programming syntax, Unlimited multi-part cues, 3D positional programming with XYZ coordinates, Automated preset focus updating with 3D system, Next Fixture button for quick selection, Active button instantly grabs specified fixtures, Track and Cue only modes, Blind programming mode. The High End Systems Hog iPC console is a small, mid-range controller which offers maximum flexibility for programmers. The Hog iPC console uses the Wholehog 3 control system but is also backwards compatible with classic Wholehog 2 software. The Hog iPC uses four universes of DMX output direct from the console, expandable to eight universes using USB DMX widgets or a USB DMX Super Widget. An unlimited number of DMX universes is possible when using networked DMX processors. Its features include: Two 12″ touchscreens, Third monitor can be connected via DVI port, Ten playback faders, Internal hard disk drive, Unlimited number of simultaneous crossfades, 2048 to 4096 DMX-512 channels via Ethernet DPs. The High End Systems Road Hog Full Boar console is designed from the ground up to provide superb lighting control with powerful programming procedures. The Full Boar expands your possibilities with an unprecedented amount of power and options. Equipped with Flying Pig Systems renowned Whole Hog software, you can create, manage, edit, and playback lighting to enhance any production. Its features include: Unlimited number of simultaneous crossfades, Two internal 12″ color touchscreens, Two external monitors or touchscreens supported, Ten playback faders with familiar playback controls, Internal DVDRW drive, Desklights, feedback LEDs, and integrated work light all dimmable. The MA Lighting grandMA Light console is an easy to operate yet powerful board. Outstanding product design and first class quality combine to form a flexible and powerful software platform, one that is perfect for controlling automated fixtures, conventional fixtures, LEDs, and more. Its features include: Full color TFT touch screens, 10 motorized faders, Control for over 4000 channels, Flexible set up configuration. Ma full – The MA Lighting grandMA console combines outstanding product design and first class quality with groundbreaking technology. Perfect for controlling automated fixtures, conventional fixtures, LEDs, and more. The grandMA also features a flexible and powerful software platform. Its features include: Integrated TFT touch screens, Control for over 4000 channels, Flexible set up configuration, Virtually unlimited storage capacity. The DMX 50 controller offers 14 reversible faders and an assignable pressure-sensitive joystick for easy programming of up to 12, 32-channel fixtures. It can store up to six sets of chases containing 240 scenes on 384 total channels of control. Other features include for and strobe as well as MIDI compatibility. 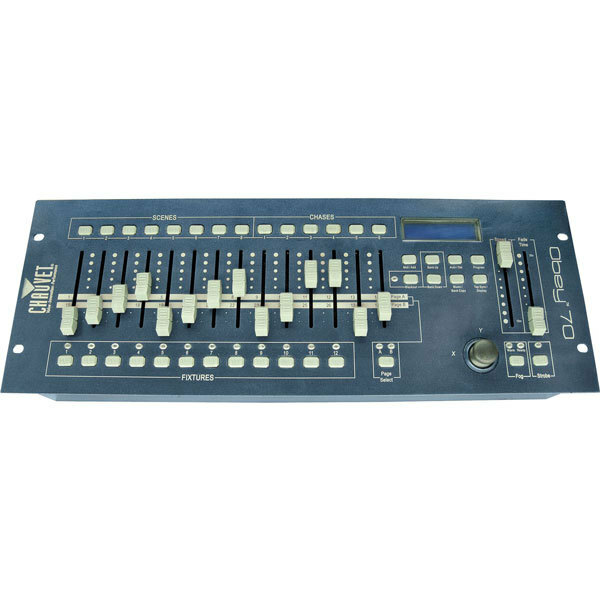 An Easy to use 16 Channel DMX Controller that features: three different operating modes, 2 x 8 (two banks of 8 channels), 8 x 8 (eight channels), 1 x 16 (one bank – 16 channels), 8 or 16 channel DMX operation, four built-in programs, eight user programmable programs, fog machine output control (compatible with ADJ Vaporizer, Stallion, MB-700, and others), XLR polarity switch, standard DMX-512 protocol & is MIDI compatible.